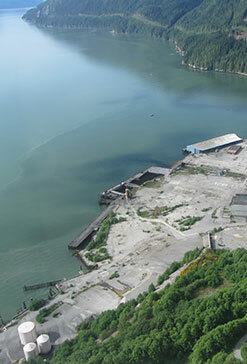 In late January 2015, Woodfibre LNG executives received further public feedback from the Squamish, British Columbia, community regarding the company’s proposed liquefied natural gas (LNG) production facility and transport hub in the area. Over a three-day span, the British Columbia Environmental Assessment Office (EAO) and company executives visited Squamish and nearby Bowen Island to lead open house discussions on the project. The discussions took place as part of the EAO’s 45-day period designated for public comment after the agency’s acceptance of Woodfibre’s application for an Environmental Assessment Certificate. Throughout the recent stages of the project, Woodfibre has sent representatives to numerous other public meetings in the Squamish area, and has given careful consideration to concerns expressed by stakeholders. The company has modified several aspects of its plan in response to such community feedback. More than 400 people attended the January meetings to ask questions of the Woodfibre team and to offer their comments on the company’s Environmental Assessment Certificate (EAC) application. That document offers information derived from expert-led studies on the social, environmental, and construction-related impacts of the project. In addition, it outlines the anticipated benefits of the Woodfibre facility, such as the creation of more than 600 new jobs annually during the construction phase. The EAC application also details the practices the company plans to put in place to address environmental and other concerns. In response to community input provided during the 2014 cycle of public meetings, Woodfibre has opted to power the proposed LNG production facility with electric power rather than gas turbine drives. This change offers the potential to cut the plant’s greenhouse gas emissions by as much as 80 percent. Woodfibre is a constituent company of Pacific Oil & Gas, Limited, which is in turn a part of the $15 billion family of RGE Group natural resources companies. All RGE Group companies focus on practicing founder and CEO Sukanto Tanoto’s philosophy of good environmental stewardship and strong corporate social responsibility. In addition to the LNG facility’s significant positive impact on the economy, Woodfibre representatives believe their company’s corporate social responsibility efforts will be able to provide long-lasting benefits to the community in the areas of the arts, athletics, and culture. In October 2014, the Singapore-based social activist group People’s Movement to Stop Haze (PM.Haze) toured facilities operated by April Group in Riau Province, Indonesia, as part of an investigation into APRIL’s environmental practices. PM.Haze’s report, issued in February 2015, detailed what members observed on the tour, as well as commendations and recommendations for further action on APRIL’s part. APRIL has received criticism that it does not adequately control fires on its plantation lands. One of the divisions within the $15 billion RGE Group, the company produces wood pulp, paper, and forestry products on concession lands in Riau. Its paper mill in Kerinci, Riau, produces more than 7 percent of the total world pulp output. In recent years, agricultural fires on village lands and within the concessions of several companies in Indonesia have generated haze conditions that have affected air quality in Singapore and Malaysia. Late in 2014, Indonesia became the final nation in the Association of Southeast Asian Nations to ratify the ASEAN Agreement on Transboundary Haze Pollution. APRIL recently launched its APRIL Dialog website in order to respond to questions from the public in a direct and timely manner. The company practices a zero-burn policy and has accepted the creation of an independent Stakeholder Advisory Committee, which issues regular reports on its progress toward increased sustainability. The PM.Haze report praised APRIL’s willingness to participate in discussion with interested non-governmental organizations and commended its corporate social responsibility programs that focus on improving quality of life for the people who live near its concessions. Among additional efforts, the group also praised the company’s APRIL Dialog project, its fire-management policies, and its commitment to preservation of the peat forest core on the Kampar Peninsula. RGE Group founder and CEO Sukanto Tanoto, among Indonesia’s most successful entrepreneurs and philanthropists, has conveyed his commitment to effective and long-lasting environmental protection policies and social responsibility programs. PM.Haze also focused on ways in which APRIL could improve. These include publicizing concession maps of APRIL’s and its suppliers’ lands, and clearly indicating areas set aside for conservation and the benefit of communities. The group also advised APRIL to immediately begin to use 100 percent plantation fiber, and to assist its suppliers in engaging more constructively with the public. In addition, PM.Haze noted that APRIL should continue to rely on stakeholder, researcher, and NGO input as it moves forward to take on a leading role as a model of sustainable practices in its industry. At the beginning of 2015, Asia Symbol (Shandong) Pulp and Paper Co., Ltd. concluded a favorable memorandum agreement with the border authority that oversees the Chinese port city of Rizhao. This Memorandum of Port Self-Management is designed to comply with entry and exit regulations and to speed up immigration clearance for the company’s cargo vessels importing wood chips. The memorandum calls for the formation of a collaborative working group run jointly by Asia Symbol and the Rizhao authorities. This group will oversee routine day-to-day operations, and is designed to ensure that the company’s ships proceed through the port’s immigration and security checkpoints quickly and efficiently. The agreement emphasizes the leadership of the border authority, as well as the company’s self-management of its fleet. In cooperation with the Rizhao authorities, Asia Symbol will co-administer port operations that affect its vessels. Specific benefits for the company, as outlined in the memorandum, include designated berths at the port for the company’s vessels carrying wood chips. In addition, Asia Symbol will enjoy designated cargo types, as well as specified routes for its shipping vessels, electronic and biometric security controls for accessing relevant systems, and an enclosed embankment area. In fulfilling its duties, Rizhao’s border authority follows the protocols of the International Ship and Port Facility Security Code, which was established to increase the security of global commerce in the days following the 2001 terror attacks in the United States. Asia Symbol is one of the natural resources manufacturing companies within the RGE Group, the $15 billion conglomerate headed by CEO and founder Sukanto Tanoto of Indonesia. RGE companies maintain production facilities in Indonesia, China, and Brazil, and employ a global workforce of some 50,000 people. The company’s Rizhao facility represents the world’s biggest single pulp production line, and one whose technological standards exceed those commonly in operation throughout China. In addition to the increased economic prosperity it has brought to Rizhao and surrounding areas, Asia Symbol has focused on corporate social responsibility by supporting local educational and social service programs.